Seventeen-year-old Parker Frost has never taken the road less traveled. Valedictorian and quintessential good girl, she's about to graduate high school without ever having kissed her crush or broken the rules. So when fate drops a clue in her lap - one that might be the key to unraveling a town mystery - she decides to take a chance. Julianna Farnetti and Shane Cruz are remembered as the golden couple of Summit Lakes High - perfect in every way, meant to be together forever. But Julianna's journal tells a different story - one of doubts about Shane and a forbidden romance with an older, artistic guy. These are the secrets that were swept away with her the night that Shane's jeep plunged into an icy river, leaving behind a grieving town and no bodies to bury. Reading Julianna's journal gives Parker the courage to start to really live - and it also gives her reasons to question what really happened the night of the accident. Armed with clues from the past, Parker enlists the help of her best friend, Kat, and Trevor, her longtime crush, to track down some leads. The mystery ends up taking Parker place that she never could have imagined. And she soon finds that taking the road less traveled makes all the difference. 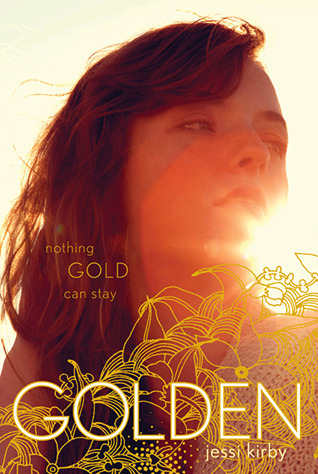 Golden was my first experience with author Jessi Kirby, and I think it was the perfect beginning to reading her books. Earning rave reviews from some of my favorite and most trusted bloggers, I knew this was a book I'd be reading on my summer vacation. From the gorgeous yellow cover to the lovely story inside, Golden was a treasure of a book. I wouldn't say I was blown away by it - but I would say that it's a book that sweeps you away and makes you take a second to pause and think about your life, your choices and your future. This coming-of-age tale focuses on Parker Frost, the "quintessential good girl." An only child with a single mother, Parker works hard to please others. She does what she's told and never steps outside those lines... until her senior year. Graduation is fast approaching, and Parker is starting to second-guess her path and her future. She's played it safe - in school, in relationships, in life - and now she's wondering what it's caused her to miss. The senior English teacher always assigns the same project at the end of the year. His students are asked to keep a journal that answers the question posed in a Mary Oliver poem - "Tell me, what is it you plan to do with your one wild and precious life?" In ten years, he'll send the journals on to the students. It's confidential and only graded for participation. Parker is his TA, and she's responsible for mailing out the journals to the adults who graduated ten years ago. When she's sorting through them, she finds the journal of golden girl Julianna Farnetti, who went missing with her boyfriend during their senior year. There was a car accident, an icy river, and the bodies were never recovered. Their loss has shrouded the town ever since. The journal is sealed, but Parker is torn on what to do. She could mail it on to Julianna's parents, she could give it back to her teacher to decide... or she could open it and read Julianna's final words. When she decides to open it, Parker takes a step toward doing the wild thing. She's drawn to Julianna's story - someone who seemed to have it all but whose words reveal secrets, internal conflict and doubt about all aspects of her life. Those thoughts cause Parker to question the accident from all those years ago. And so begins the mystery driving this novel. What really happened to Julianna and Shane on that night ten years ago? It's not really a mystery in the traditional sense. It's a quiet book that focuses more on feelings and reflection than on action or suspense. I think that tone worked perfectly in this book and really strengthened the coming-of-age aspect of this book. From the realistic friendship to the sweet hints at romance, I really enjoyed several aspects of Golden. I was intrigued by the mystery, caught up in Parker's personal growth and charmed by the poetry. In a word, I'd describe Golden as lovely. It is absolutely a book that has "a beauty that appeals to the heart or mind as well as to the eye" (Dictionary.com). It's not just a pretty story with memorable characters. It's a thoughtful reflection with so much heart. For me, it was a study in making choices out of fear. Whether it's fear of the future or fear of disappointing someone, there are so many things that can hold you back in life. But saddest of all is when YOU are the person who holds yourself back. When the limitations on your life are there because of choices you've made or even ones you've been too afraid to make. That's what struck me the most in Golden: choices. The ones you make. The ones you avoid. The ones you regret. The ones you cherish. And the ones that change your life forever. I actually wouldn't rave about this book, and it probably won't make my list of absolute favorite reads of 2013. I really enjoyed it, but I was disappointed by certain aspects of the storyline that I felt were too vague, too convenient or perhaps not fleshed out enough. I'd expected the ending to pack more of a punch, so I felt slightly deflated when it didn't. However, it did make me stop, pause and reflect. I connected personally to Parker's growth and to some of the themes, so I did love it in that respect. So, this is a unique review where I tell you that I loved this book even though I didn't love everything about the story. It's one of those rare times where the magic of what Kirby explores was meaningful to me and made the book more personal. I wish there'd been just a little bit more toward the end, but I still found Golden emotional and memorable. "But as much as we wish it were different, the truth is, our worlds are sometimes balanced on choices we make and the secrets we keep." I have really been wanting to read this one for a while. The cover is entrancing and I think it would be a nice change of pace for me. I love some of the details inside, too, that make it really consistent with the cover. Definitely a well-designed book! It was a nice change of pace for me - hope you enjoy it! Oh wow, I'm glad you liked this one but I'm sorry it was a little bit disappointing - at least that's what I'm picking up from the tone of your review? I think it meant so much to me because I saw myself as Parker in a lot of ways so I read that particular part of the book with my hand clutched to my chest almost willing Parker to BE BOLD!!! Yeah, I actually need to email you about this one. I identified with Parker A TON, so that was what I loved about it. I was really caught up in her story and rooting for her personal growth. That's what I meant when I mentioned certain aspects felt really personal and relatable so I loved that aspect. I didn't love (and was disappointed by) a lot of things with Julianna's story. I obviously didn't want to get into it in my review, but there were aspects of that story that kept me from whole-heartedly loving this one. I think I just got overly analytical about certain things. Anyway, I'll email you to discuss. But yes, I definitely think it was refreshing and it made me want to read more from Kirby! Yeah, I think it's interesting how many bloggers have expressed the personal connection they felt to the book. I think that's a really special element of this character and this story! GREAT review. GREAT. Because I felt the same way. It won't make the list of best books I've read this year, but it did really make me think a lot. And also make me appreciate Kirby's growth as a writer. I loved the friendship in this book, and also Parker's bravery. SO glad you felt the same way! I definitely felt like the oddball in the fact that it won't be a favorite, but I can definitely see why it would be for so many. I haven't read anything by Kirby before, but I'm certainly interested in reading more from her. I adored this book, as you probably know already! But you make a very valid point about how some elements were certainly vague or felt unfinished. I think there could definitely have been improvements in some parts of the book, but overall, the story was rich and compelling and truly made me think. Loved Kirby's writing! I can definitely see why so many people adored this book! I think I may have loved it more if I hadn't had such high expectations because those caused me to be more critical while I was reading the book. I really loved Kirby's writing too! I look forward to more from her and think she'll only grow even more from here.